The final room is a Star Wars themed room with a full over full bunk bed. This brand new 14 bed 11 Bath Luxury Mansion is currently being built and furnished very soon and is waiting for your next family getaway in pure luxury. This popular model features 5 bedrooms on the main floor and an additional 9 bedrooms on the second floor. You will find an open concept main floor living area with large kitchen with huge island as well as 2 refrigerators and 2 dishwashers. Cook your favorite family meal while talking with your family and friends in the open concept living and dining area. Walk out the large patio doors to the covered lanai where you can eat dinner, have a drink, or just sit and relax. 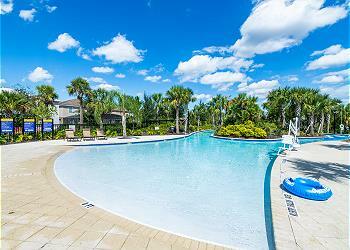 Sit in the sun on the pool deck or take a splash in the large screened in pool , keeping out those pesky bugs. Upstairs you will find a large lounge area, movie theater room and those 9 bedrooms, many with ensuites. You will also find 2 washers and dryers in the home, one on each floor. This home is situated in the beautiful Solterra Resort with amenities shown below and something for everyone. If for some reason you want to leave the home the resort center is within walking distance and offers 5,600 square foot clubhouse, community activities direct, fitness center with 24 hour access, resort style pool with water slide and lazy river, pool side cabanas with food and beverage service, tennis courts and soccer field.